Scientists have developed, potentially, the most efficient solar cell in the world. 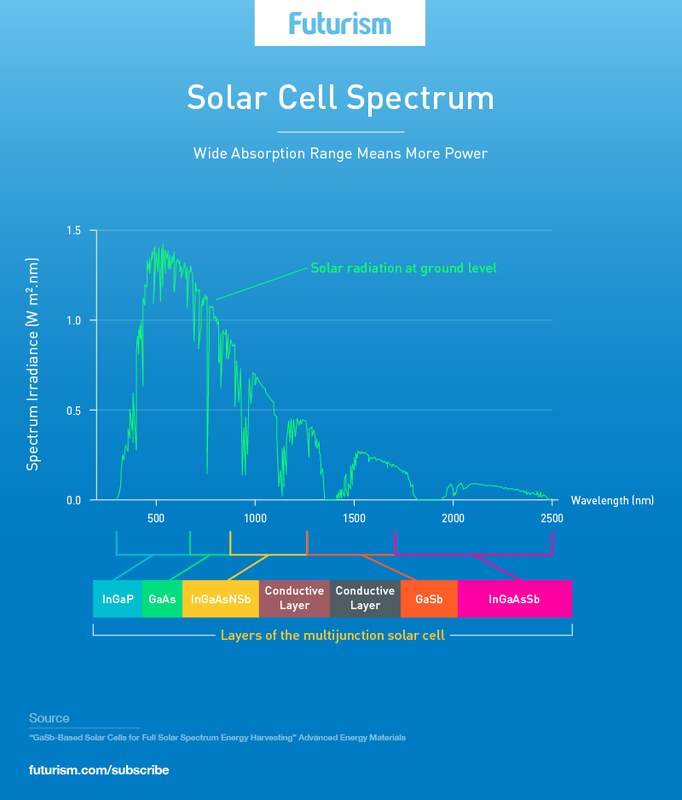 Scientists have developed a solar cell that's more efficient than any other currently on the market by using innovative technology capable of capturing more parts of the solar spectrum. Innovation like this is crucial for the mitigating the effects of climate change. Scientists have developed a solar cell that is capable of converting direct sunlight into electricity with 44.5 percent efficiency — making it, potentially, the most efficient solar cell in the world. Current solar technology only converts electricity with a maximum efficiency of about 25 percent. The impressive cell works by stacking multiple layers of solar hardware into a single cell, each of which absorbs a different aspect of the solar spectrum. This new tech is innovative compared to other cells in two regards. First, it uses transfer printing, which allowed the scientists to assemble the component parts with a high degree of precision. Second, it uses materials derived from gallium antimonide (GaSb) substrates, which are usually reserved for infrared lasers and photodetectors, in order to absorb every part of the direct sunlight. 1.1 billion people still lack access to electricity. How can we bring energy to all? As with any piece of energy converting technology, in order to maximize the amount of energy produced, one can either increase the quantity of converters, or improve the efficiency of the converters themselves. If this technology is scaled up, solar panels would require roughly half the space to produce the same amount of energy as the systems in place today due to their greater efficiency. Although producing the initial was expensive, this experiment — and others like it — are crucial to show the upper limits of what is possible in solar technology. It has established a precedent, and the space in the market for another individual to make the cell cost effective. Solar power already accounts for an increasing amount of energy produced worldwide, and it is becoming ever cheaper. Therefore, it is important to continue to find ways that make solar energy more and more effective so that it can surpass fossil-fuel based energy and become a green energy source capable of helping our planet (and us) to survive the harm we have caused it.